I do love suspense and romance. This one is a keeper. The only issue I had was that the narrator had difficulty portraying the male voice. It came across as more of a teen’s voice than a grown, large Scottish man. I love adventure romance. This was billed as such but the girl didn’t even get to the mountains until about 90 minutes left in the story. This is more self discovery than adventure. Feels like false advertising in the description. A princess and her doppelganger are missing, and a grief-stricken king turns to Aaron Timmer for answers. As a bodyguard to the king, Aaron's mission is clear when one of the women is found: Keep her out of danger and find the abductor. But how can he do that when the mystery woman doesn't remember the events leading up to her disappearance? Terror strikes a young woman when she wakes up in a private hospital with no idea who she is, how she came to be hospitalized - and whose baby she's carrying. The story needed more background to truly buy into the events. I listen to a lot of audiobooks. I like romantic intrigue and suspense. I had a difficult time believing that these characters had the intense feelings that were purported. As for the narrator, there weren’t pauses between point of views. He would be narrating from the male’s POV and without a pause would switch to the female. I had to rewind a few times to get back into the story. It’s a decent plot that, with a rewrite, could be more believable and sellable. The story was promising but I just couldn't connect with them falling in love so quickly. Lots of plot wholes and lack of character development. The performance kept bringing me out of the story when she dropped her t's and mispronounced words...especially escape and corrugated. I’m so delighted to have listened to a well edited, intelligent, steamy, intriguing and heartfelt story. This is the second time I’ve listened to it because of the newest book, Catalyst. 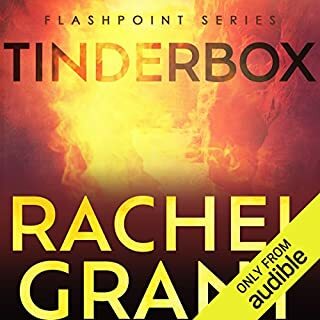 Thank you Rachel Grant and Audible!! !